PASQUOTANK Co., N.C. - Authorities announced Friday that four inmates have been charged with 1st Degree Murder in relation to the failed inmate escape attempt at Pasquotank Correctional Institution that left two prison employees dead. The incident occurred Thursday, October 12 around 3 p.m. when officials say inmates started a fire around 3 p.m. in the facility's Specialty Sewing Plant, where about 30 inmates work producing embroidered logo items, safety vests and other sewn items. After the fire was set, several inmates unsuccessfully attempted to escape. During the escape attempt, two prison employees were killed. Four inmates and 10 other prison employees were injured. Authorities have charged 28-year-old Mikel Brady, 29-year-old Wisezah Buckman, 33-year-old Seth J. Frazier, and 30-year-old Jonathan M. Monk with two counts each of first-degree murder. 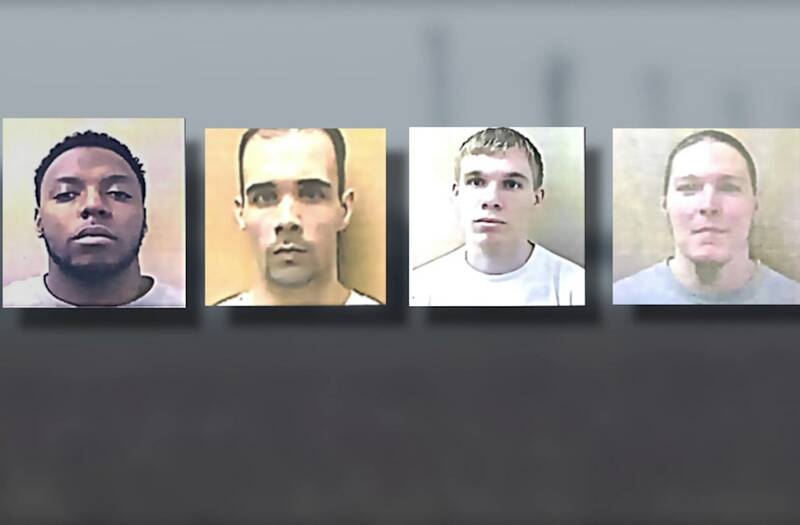 Authorities announced Friday that four inmates have been charged with first-degree murder in relation to the failed inmate escape attempt at Pasquotank Correctional Institution in North Carolina that left two prison employees dead. After the incident, all four were transported to other prisons. Brady and Frazier are now at Central Prison while Monk and Buckman are at Polk Youth Institution. Buckman has felony charges dating back to 2007, including armed robbery and breaking and entering. In 2014, he was charged with second-degree murder, assault with a deadly weapon with intent to kill inflicting serious injury and willful injury to property. In 2006, Fraizer was charged with speeding to elude an arrest. In 2008 he was charged with taking indecent liberties with a child. In October 2011, he was charged with felony burglary in the first degree and possession of a firearm by a felon. Mikel Brady was in prison for three felonies stemming from an incident in 2013: attempted first-degree murder, assault with a deadly weapon with intent to kill inflicting serious injury and assaulting a law enforcement officer. Jonathan Monk was in prison for attempted first-degree murder, assault with a deadly weapon with intent to kill inflicting serious injury and first-degree burglary. The employees that were killed were identified as 35-year-old Correctional Officer Justin Smith and 50-year-old Correction Enterprises Manager Veronica Darden. Smith provided security in the Correction Enterprises Specialty Sewing Plant and had worked as a correctional officer since 2012. Darden supervised inmates at the Specialty Sewing Plant for the last 10 years and previously worked as a correctional officer. One of the injured employees, Correctional Officer Scott Stormer, spoke to News 3 after being released from the hospital. He said he was stabbed in the back three times by an inmate. "I got hit in the back, you know like someone hits you in the back, and he probably hit and hit again," Stormer said. "I was dealing with one inmate and the other one came up behind me and stabbed me in the back three times," Stormer said. Two more victims remain in the hospital in critical condition. A hearing is scheduled in front of a Grand Jury on October 30 where more evidence will be presented that may lead to additional charges.